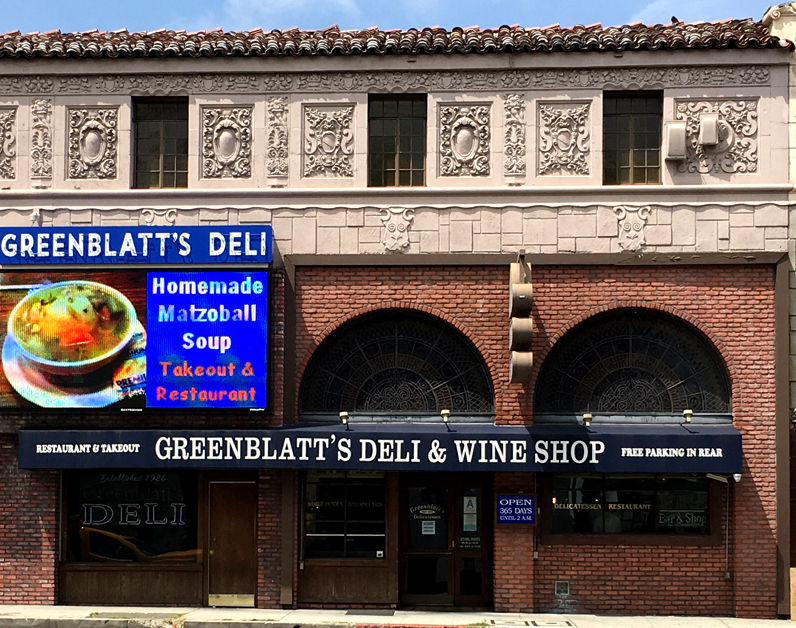 (1926) Greenblatt’s Deli, Hollywood | Remains of L.A.
I’d been to Greenblatt’s Deli before, but not recently, and I hadn’t written about any places in Hollywood in a while, so I decided to head over for lunch. I always like that section of Sunset because I stayed very near there on my first ever trip to L.A., more than twenty years ago. I remember going for a long walk right past there, but I think I was more interested in looking at the Laugh Factory next door than at Greenblatt’s; at least I don’t remember it. The front of Greenblatt’s is all brick and carved stone, a really gorgeous old building, but someone put a gigantic, garish digital sign on the front of it. I wish they hadn’t, but I suppose if it attracts business that they need to stay open it’s worth it? 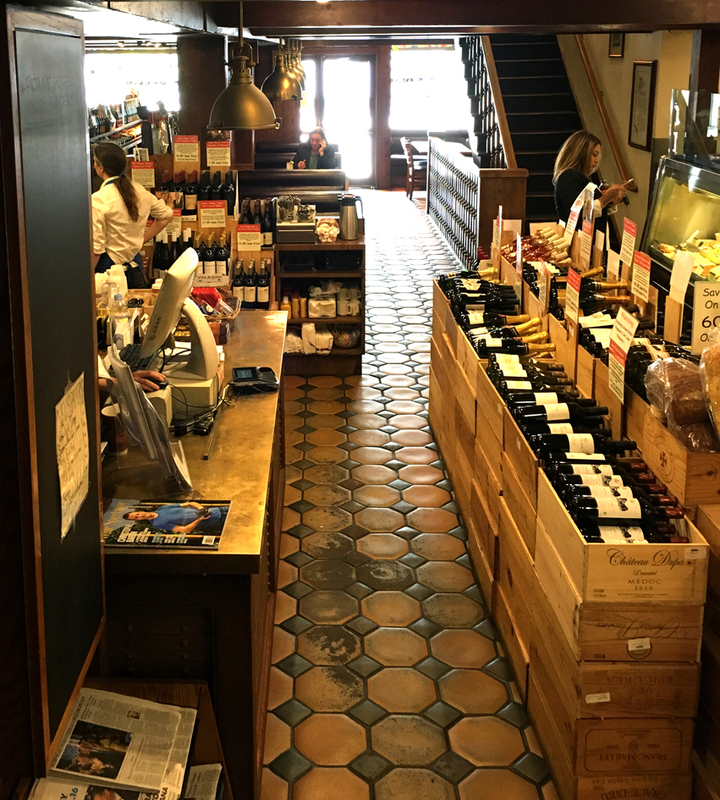 -The first floor is the deli and wine shop, with some booths, but mostly the deli counter and lots and lots of wine bottles. There’s more seating upstairs so I went there. Big, heavy wood beams, solid wood stairs and floors, a terrific white tile ceiling with broad beams, brown booths that match the wood in a very pleasing way, and two huge, oval stained glass windows that are a perfect colorful counterpoint to all the dark brown wood. I sat facing the windows because it made me happy to look at them. There are lots of plants in front of the windows too. 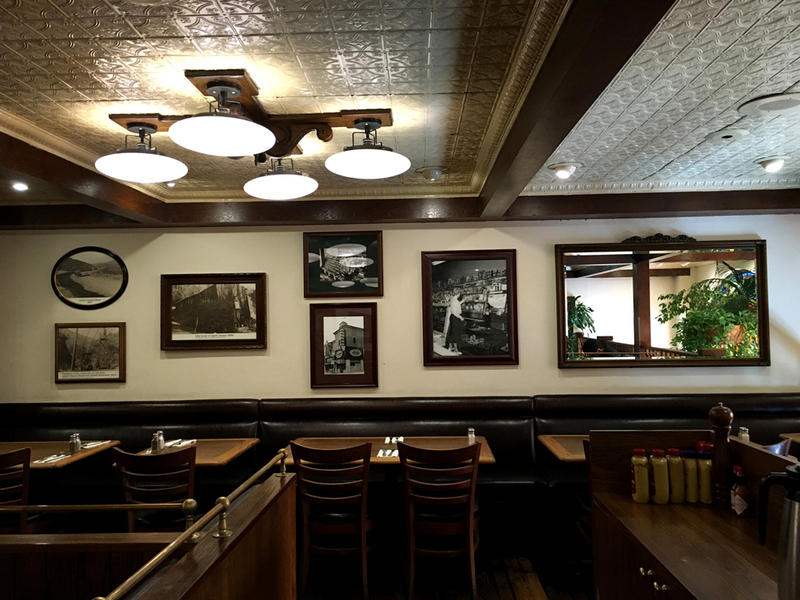 On the walls are black-and-white photos of old Burbank scenes, and old ads for soup and coca-cola. The ads are framed and matted with what looks like old-fashioned wallpaper, making them seem much fancier and nicer than old ads on walls sometimes look. -I wanted the potato pancake but then got confused and ordered the potato knish instead; luckily the waiter realized when I said I wanted extra applesauce instead of sour cream. I thought one potato pancake would be too much and they only came in orders of one or three so I got three. Turned out they were huge; one would have been fine. I was only able to eat half; I had to get a box for the rest. I also got a fruit cup, which was just a fruit cup. -On the back of the menu it says “Greenblatt’s Bucket List: 8 Things You Have to Eat Before You Die:” and then there’s a list of sandwiches and salads and soup and cake. So one will have to make several trips at least before they die. None of the things were what I was in the mood for. I always wonder if the term “bucket list” started with the movie bucket list. I don’t remember ever hearing it before that movie, but maybe it was around and I just didn’t notice it. Certainly it wasn’t so prevalent. Funny that it has become such a common term because of a movie that I don’t think many people saw. -A woman sitting near me was taking to the guy she’s with about finding someone online who she wanted to date: “I was like, tattoos AND drinking? Who IS this guy? !” at first I thought the guy with her was the guy she was talking about, like they were on their first date or something, but then she said “I was so nervous, I got a cold sore!” so maybe not? -The acoustics were odd; the noise of the people sitting downstairs came floating upstairs so it sounded like they were right next to me, maybe because I was sitting right next to the stairs. It was loud but not bad, just made for a pleasant background noise. It might have bothered me if I was there with anyone and trying to have a conversation, but I wasn’t and so it was fine. -To get to the restrooms I had to go down the stairs, past the deli counter, and up another flight of stairs. Of course I got lost, but the people were quite helpful. I wish I knew enough about wood and architecture to properly describe these stairs and how much I liked them. They were just so… solid, I guess. Like they’d been there forever and would always be there. Like they were built out of strong trees by strong people who knew a whole lot about building stairs. -On the wall near the restroom is a picture by Bob Kane, of Batman and Robin talking about how much they love Greenblatt’s. I’ve never seen either of them look so happy. I don’t know what it is with delis and pictures of famous cartoon characters saying how much they love delis. -A couple sitting near me got up to leave and I realized the guy had a little dog with him. As they were walking by, the guy said to his date, “The best thing the VA ever did for me was give me a prescription for this guy.” I’m worried it sounds like I’m making that up, because it was such an incredibly perfect thing to say and so lucky that he said it right when I could hear it, but he did say it. If I was making it up I’d make it less perfect. 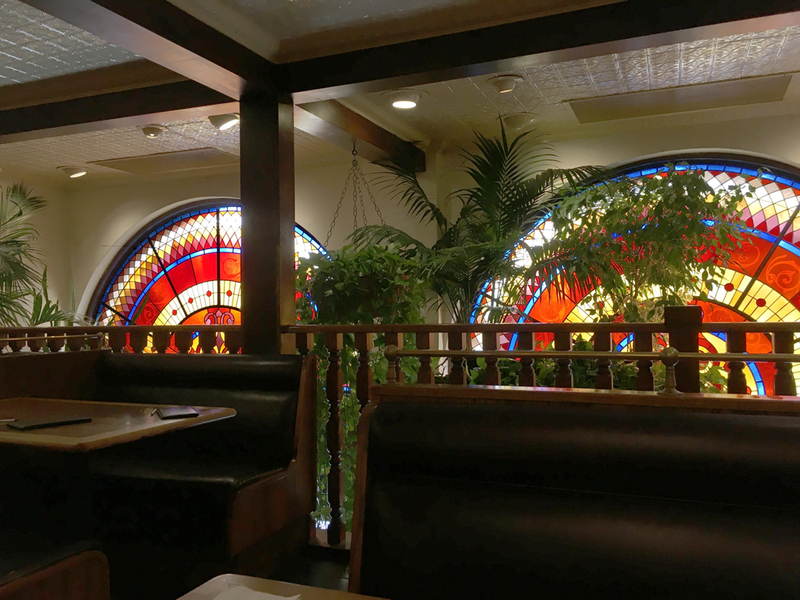 -Because my booth was right next to the stairs, and because I was his only table for a little while, the waiter kept coming and standing on a stair and poking his head over the side of the wall to ask if I needed anything, or to give me extra applesauce. It was sort of startling when his head would pop up, but also utterly charming. -Two college students near me, I couldn’t tell if they were musicians or artists, kept assuring each other that at some schools you can be just okay and still keep up with the rest of the class, but at their school it was a whole different thing, you had to be truly excellent. They had that exact conversation at least three times. 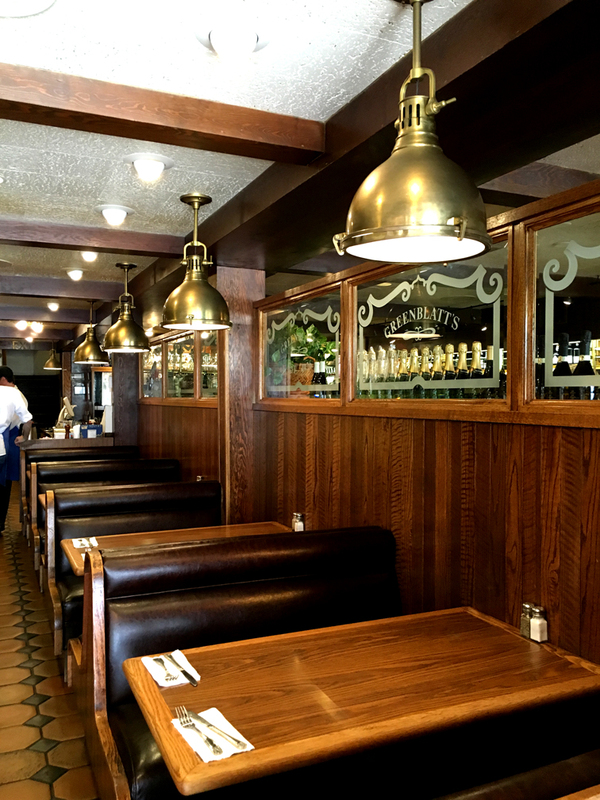 -Some new people came and sat down and commented on how empty it was, and the waitress said that it had been quiet for a couple weeks now, maybe because of summer vacation? It was full to bursting by the time I left, though. -Two women sat near me with the most delightful English accents and lovely voices. I couldn’t hear what they were saying; just the sounds of their voices were like music. But then, when I was looking in their direction–not staring at them, honest, my booth faced theirs–one of the women gave me a very dirty look. I think only nice people should have such nice voices. -A woman behind me told her companion that the best meal she’d ever had was at a restaurant inside Union Station. I wonder if I could go there for the blog? The restaurant is probably not very old but the station itself certainly is. Maybe it would count? -A woman called across the room to the waitress, asking for more water, and when the waitress got there said, “I’m sorry to shout for you, it’s just I was waiting and waiting for you to come by and you just kept ignoring me…” I saw the waitress at her table three minutes before that. I am not exaggerating. It was three minutes. The same woman spent a long time emphatically explaining to her dining companion that having short hair is a nightmare because of how cold your neck gets. She didn’t give any other reasons for why she loathed short hair, just went on about the horrors of a chilly neck. 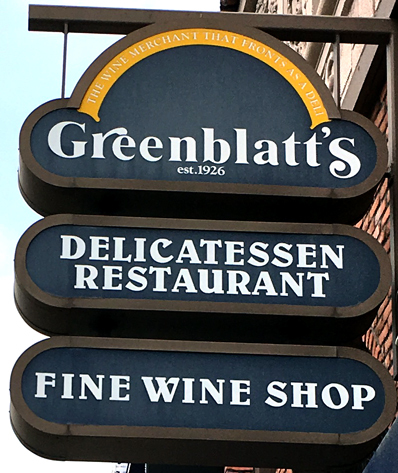 -The sign over Greenblatt’s says, in small letters, “The wine merchant that fronts as a deli.” There certainly is a great deal of wine for sale. Over the wine bins in the middle of the front room were a bunch of funny signs with pictures. Like, one picture was of a baby with its hand over its eyes, and the sign indicated that he was ashamed because his wine wasn’t as good at this wine. Another had a picture of Trump, and it said that if you’re having a bad hair day, you should try this wine. There was a picture of the Clintons as a young couple and a picture of Al Gore and a picture of a dog with glasses, and various funny comments connecting the pictures to the wine. I really appreciated them. I like thinking about the person whose job it is to come up with them, finding the pictures and writing the captions. I bet they enjoy it a lot. What I read while I ate: “The Garden on Sunset” by Martin Turnbull, the first of a wonderful series of novels set at the Garden of Allah in the 1920’s and ’30s. The Garden of Allah was a hotel at Sunset and Crescent Heights, and the first place I’ll go if I’m ever able to travel in time. F Scott Fitzgerald lived in one of the bungalows, and Harpo Marx stayed there, and Tallulah Bankhead, and all sorts of other fascinating people. The Martin Turnball novels are wonderful, they bring it to life perfectly and he has done massive amounts of research. Greenblatt’s is just a block and a half from where it stood, and after I ate I walked over and stared at the ugly strip mall that is there now. It’s heart breaking. But then I turned my back on it and looked at the hills, and imagined all the people who stood outside the hotel and saw this same (more or less) view. What Sort of Ghost I’d Expect to Find if I Believed in Ghosts Which I do Not: A young woman who worked as a secretary while she tried to make it as an actress, who would stop in often on the way home from work for a cup of soup, because it tasted just like the kind her mom made back east, and made her feel safe. Categories: Restaurants | Tags: 1926, delis, historical L.A., hollywood, Los Angeles, Restaurants, retro, vintage | Permalink.